while he went back to Montana. (1963-75), was at the shop giving us the board’s complete history.Danny told us that in the late ‘60s, surfboard manufacturers were scrambling to get on the shortboard bandwagon. 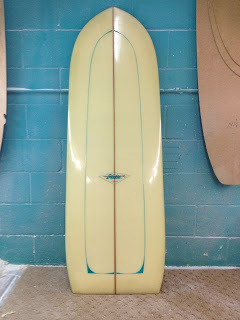 Hobie delivered several longboard blanks to Gunther Glassing with orders to re-shape the blanks into shorter boards. Danny said the only shortboard shape he was familiar with at the time was a paipo, and offered to shape a big paipo. He referred to the board as a “cut-down”. The boards were glassed by David Artz. The board’s dimensions are 5’1”, 19” x 22-1/2” x 22”, 3-1/2”thick. The wide point is 13”up from the tail and extends to a point 22” up from the tail. Board has significant belly and crowned deck, with eggy rails. Thickness flow is 2-3/4”@12” down from nose, 3-1/2” at 24” up from tail and 3”@ 12” up from tail. Board was glassed with double 10-oz Silane, deck and bottom, and weighs 17lbs! Fins were made by “Fly” using 10 layers of 10-oz mat (blue resin) sandwiched between layers of 10-oz silane (black resin). Fin template is “reversed skeg”, 6-1/2” base and 3-5/8” depth, and is not foiled. Trailing edge of fins is set 3-3/4” up from tail and 4-1/2” off rail, with no toe-in. it was like opening a time capsule. I asked Danny if the board was ridden prone or standing up. He said most people rode them prone, but knew of one surfer who was able to stand up on it.